Megan with her talking Justin Bieber doll. I am the music therapist at Akron Children’s Hospital in Akron, Ohio, and I’m writing to see if Justin Bieber would do us a huge favor by dropping by to visit Megan Parker. Megan is a 13-year-old girl and patient that I’ve been working with since she has been hospitalized in our pediatric intensive care unit (PICU). Megan has end-stage Ulrich’s progressive muscular dystrophy and has been in the hospital since September. Muscular dystrophy causes a progressive weakening and loss of muscle function over time, resulting in a dramatically shortened life span. Megan’s disease has left her with very limited movement and the inability to breathe without support from a ventilator. Her diagnosis is terminal and there is no cure. Megan is a HUGE Justin Bieber fan and his music has been instrumental in her well-being during her lengthy stay in the hospital. When she arrived, she was unable to speak due to her ventilator. She learned to play the ukulele, which wasn’t easy since she has very limited movement in her hands. The very first song she learned to play was Baby. After about a month, Megan regained some speaking/singing ability for short amounts of time through a maneuver with her ventilator. Over the course of 2 months, Megan worked with me to record a CD and held a CD release party in her hospital room where she performed for a large group of hospital staff. This party also commemorated her 54th hospital day, which was the longest hospital stay in her life. She sang Justin Bieber’s songs and played the ukelele. 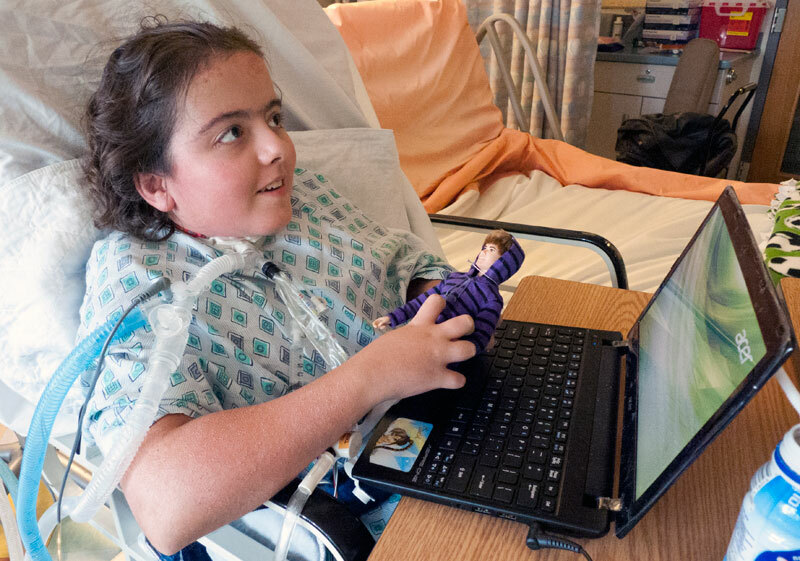 Throughout the entire experience, she had a large Justin Bieber poster hanging in a place of honor in her hospital room. Music, especially Justin Bieber’s, has played a large part in Megan’s emotional well-being while hospitalized. It has provided her with a creative outlet to normalize her experience while in such an abnormal environment. Through Justin Bieber’s music, Megan has formed relationships with staff and strengthened relationships with her family. She has an outlet to express herself and the music has helped alleviate pain, anxiety and stress associated with a long hospital stay. Through the CD, she has created a legacy that will live on with her family after she has passed away. It would mean the world to Megan if Justin Bieber could stop at the hospital to visit her and sign her treasured poster that has seen her through the hardest period of her young life. Although she faces even tougher times ahead, the experience of meeting Justin Bieber, her idol, would carry her through to the end of her life. Getting through surgeries with the help of a "friend"
It is hard to type when tears are running down your face ..God bless this beautiful child and her fight to live ,God bless you . I’m sure a stop at the hospital by Justin would make more than one little girl happy—there must be more who would be uplifted by such a visit. Justin–are you out there?? ?